Many of you who read my novels also happen to read those of my fiancé Dan Rix. Today I’m happy to announce that his latest book, God’s Loophole, is now for sale on Amazon! Make sure to grab your copy here! For those of you who don’t know much about God’s Loophole and want to learn more, I’ve included the cover and book description below! Nicknamed the bubble, an astonishing new technology isolates users from reality and lets them directly experience quantum effects. Inside the bubble, humans can even manipulate individual atoms. For the computer industry, it’s a dream come true. Except the bubble may have side effects. After being inside the bubble for only a few minutes, eighteen-year-old Gabe Rockwell feels a strange desire to go inside again. He has nightmares and wakes up vomiting in the middle of the night with no idea who he is. Even more troubling, the bubble seems to eat through every kind of radiation shielding known to man...whether it’s plugged in or not. Now, ever since that first time in the bubble, Gabe has been harboring a terrifying secret—a power, whose addictive pull he finds harder and harder to resist with each passing day: he’s developed the ability to move objects with his mind. 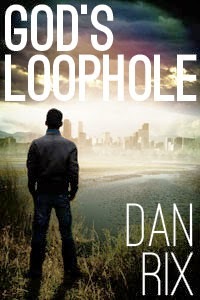 Combining the genres of technothriller, science fiction, and young adult, God’s Loophole is the first book in a new mind-bending trilogy by Dan Rix. Scroll up, click the buy button, and start reading God’s Loophole on your kindle. Like what you read? Click here to visit God’s Loophole on Amazon and read more about it! Read Hope’s Decree for FREE! The Vanishing Girl Sale Ends on Friday! The Vanishing Girl is on Sale for 99 Cents!